HexCmp is a program, which combines together the features of a hex file comparison application and a convenient hex editor. HexTemplate gives you a convenient way to view binary files with a specific structure. HexTemplate includes a visual template editor. 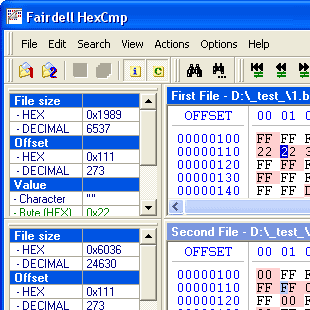 HexCmp is a program, which combines together the features of a hex file comparison application and a convenient hex editor. The program will help you to compare files in binary format, at the same time serving as a hex editor that will edit and modify your files. Hex comparison is made on-the-fly, while scrolling down the files. Enhanced with features like color highlighting; synchronous scrolling; an Info panel, which shows the file information in different formats and more, this program will most definitely become an asset for both home users and companies. Instead of the full files comparison, upon loading you can compare just the current parts of the files, displayed on the screen, which saves you your working time. HexCmp supports files up to 4 GB. You can navigate among different blocks or files, choose the required parts of files to compare (just scroll down the file), set your own color scheme, use the Undo, Redo and Search functions. Besides the hex format, the program can also compare files in text format. String searching can be done in both formats as well. All commands are conveniently assigned to hotkeys. You can work with HexCmp, using your keyboard only. Languages: English, German, French, Russian, Dutch, Slovak, Czech, Greek, Estonian, Italian, Korean, Portuguese, Polish. Please, do not send your language file prior to contacting us (required) via email or via an appropriate forum, as a new version with exactly this language support can be already under development. SAVE: HexCmp + HexTemplate only 49.95 USD (you save 9.95 USD) - Order Now! HexTemplate gives you a convenient way to view binary files with a specific structure. HexTemplate includes a visual template editor. Unlike many similar programs, the HexTemplate template editor doesn't require any special skills or knowledge of programming and script languages. It allows you to create the template you need easily using the mouse and shortcut menus. The template you're editing is shown as a tree to make it easier to understand the template structure. HexTemplate has a necessary set of data types for displaying templates of any complexity.